A paper published today in the Journal of Geophysical Research Space Physics finds that recent low solar activity "mirrors" extended solar minimums in the 19th & early 20th centuries, as well as other periods over the past 1000 years consistent with the Centennial Gleissberg Cycle of solar activity. Such periods have also been associated with global cooling. 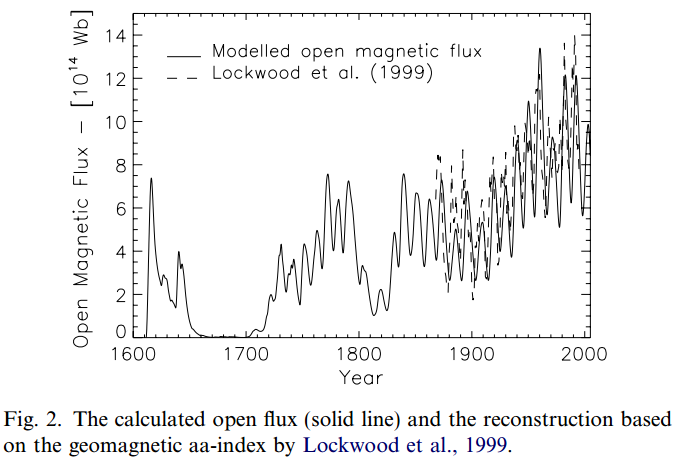 "The recent extended minimum of solar and geomagnetic variability (XSM) mirrors the XSMs in the 19th and 20th centuries: 1810–1830 and 1900–1910. Such extended minima also were evident in aurorae reported from 450 AD to 1450 AD. This paper argues that these minima are consistent with minima of the Centennial Gleissberg Cycles (CGC), a 90–100 year variation observed on the Sun, in the solar wind, at the Earth and throughout the Heliosphere. The occurrence of the recent XSM is consistent with the existence of the CGC as a quasi-periodic variation of the solar dynamo. Evidence of CGC's is provided by the multi-century sunspot record, by the almost 150-year record of indexes of geomagnetic activity (1868-present), by 1,000 years of observations of aurorae (from 450 to 1450 AD) and millennial records of radionuclides in ice cores." If it is true that the current lull in solar activity is "consistent with minima of the Centennial Gleissberg Cycles," and the Gleissberg Cycle is a real solar cycle, the current Gleissberg minimum could last a few decades before solar activity begins to rise again. Solar physicist Habibullo Abdussamatov predicts the current lull in solar activity will continue until about the middle of the 21st century and lead to a new Little Ice Age within the next 30 years. The recent extended minimum of solar and geomagnetic variability (XSM) mirrors the XSMs in the 19th and 20th centuries: 1810–1830 and 1900–1910. Such extended minima also were evident in aurorae reported from 450 AD to 1450 AD. This paper argues that these minima are consistent with minima of the Centennial Gleissberg Cycles (CGC), a 90–100 year variation observed on the Sun, in the solar wind, at the Earth and throughout the Heliosphere. The occurrence of the recent XSM is consistent with the existence of the CGC as a quasi-periodic variation of the solar dynamo. Evidence of CGC's is provided by the multi-century sunspot record, by the almost 150-year record of indexes of geomagnetic activity (1868-present), by 1,000 years of observations of aurorae (from 450 to 1450 AD) and millennial records of radionuclides in ice cores. The aa index of geomagnetic activity carries information about the two components of the solar magnetic field (toroidal and poloidal), one driven by flares and CMEs (related to the toroidal field) the other driven by co-rotating interaction regions in the solar wind (related to the poloidal field). These two components systematically vary in their intensity and relative phase giving us information about centennial changes of the sources of solar dynamo during the recent CGC over the last century. The dipole and quadrupole modes of the solar magnetic field changed in relative amplitude and phase; the quadrupole mode became more important as the XSM was approached. Some implications for the solar dynamo theory are discussed.